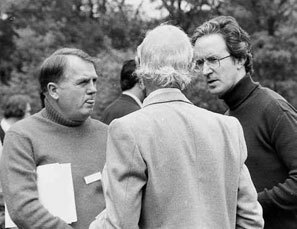 Mel Greaves (right) with Don Pinkel (left) and Professor David Galton (centre) at a conference in Wilsede, Germany (1982). "The death of any child is a tragedy; a promise of life stolen. A child suffering from and then dying of cancer seems hideously cruel. There was a time in Europe when the loss of an infant or childwas commonplace due to endemic infections or malnutrition. This still happens, disgracefully so, on a prodigious scale in less developed regions of the planet." 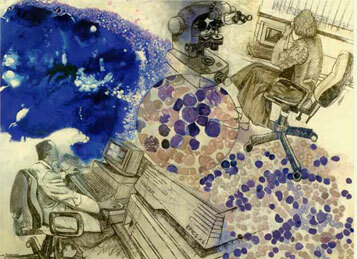 ‘Typing the Leukaemic Cells’ by Susan Macfarlane. "The narratives are illustrated with evocative paintings on childhood leukaemia by a remarkable artist, Susan Macfarlane. Sadly, Susan died in 2002 and we are grateful to her sons, Euan and Angus Mackay, for their permission to reproduce some of her extraordinary paintings here, all of which derive from the exhibition ‘Living with Leukaemia’, commissioned by Dr. Geoffrey Farrer-Brown. WHITE BLOOD - Personal Journeys with Childhood Leukaemia © World Scientific Publishing Co. Pte. Ltd.
Introduction to childhood leukemia - Don Pinkel: here. A scientists journey - Mel Greaves: here.